Erica Bunker | DIY Style! The Art of Cultivating a Stylish Wardrobe: Vogue Couturier Design 2925 | 1970's Vintage Fabiani Coat! 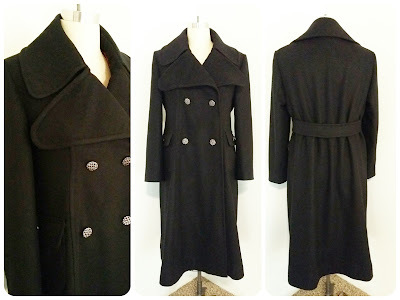 Vogue Couturier Design 2925 | 1970's Vintage Fabiani Coat! I love coatmaking! I love the art of tailoring a coat. 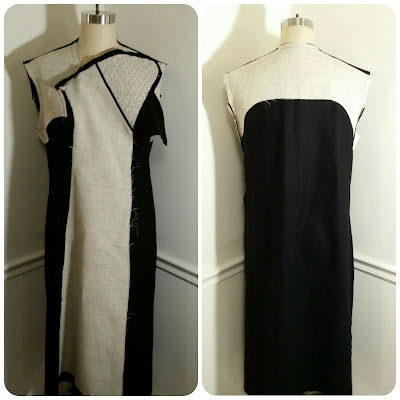 I've learned that so many people are intimidated at the thought of sewing a coat. I'm a dive into the deep end, head first kinda sewing gal. So when it comes to tackling a sewing project? I ain't never scared! (A double negative was needed to convey that feeling!) But I do understand how overwhelming some can feel when it comes to fully tailoring a coat. It's a lot of steps and the best skill you can possess? Patience. The reason why I've fallen in love with vintage coat patterns are the drafting, the pattern pieces and the instructions. In the past, I would have had to draft interfacing pattern pieces and sew with a stack of reference books. And based on all of the things I've learned from multiple tailoring resources over the years, these instructions are comprehensive and everything I needed to make this coat. Vintage patterns come in single pattern sizes. I used the size 14. The sizing and ease is generous. I can wear a blazer underneath this coat with comfort. I added 3.25" to the length. That was the only fit alteration I needed. 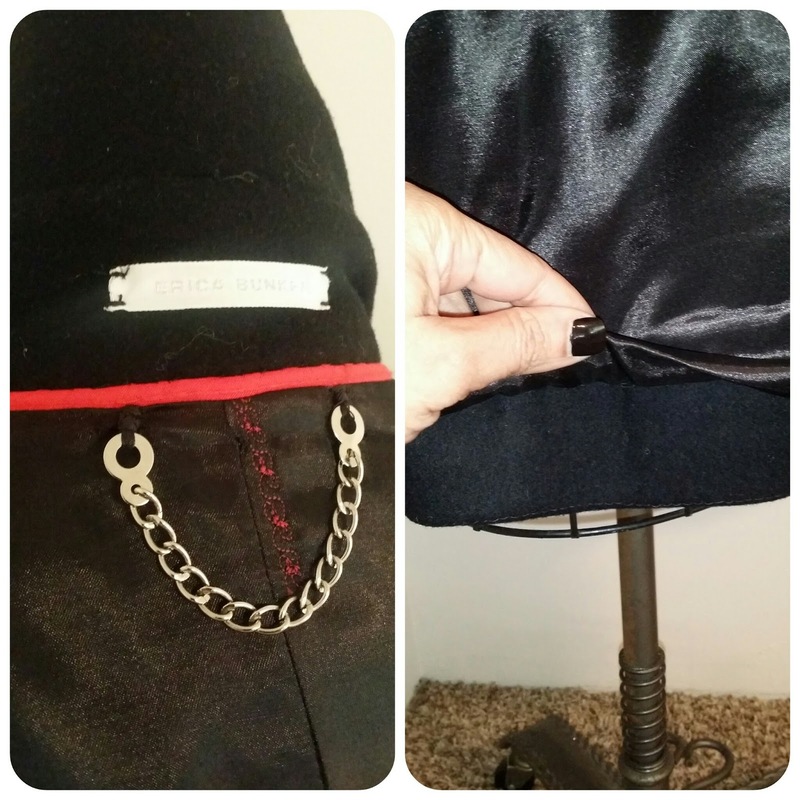 My fabric is a pretty basic Black Solid 100% Wool Coating from Mood Fabrics.com. The fronts of the coat are interfaced with hair canvas. (If you need to buy some, be sure to use my coupon code in the sidebar.) In order to stay the roll line of the lapels, I used 1/4" black twill tape. Here is a previous post discussing the hair canvas interfacing and my machine padstitching. The collar is interfaced exactly like the lapels. The backstay is also cut from the hair canvas. I normally use plan muslin fabric. But the pattern suggested the interfacing. I was concerned that the hair canvas would be prickly with only the barrier of the lining fabric. From wearing it briefly for the photos, I didn't feel anything. Here's hoping it stays that way. The back of the coat also has an interfaced Martingale. The pattern did not suggest this, but this is where I do my own thing. I know how I like to set sleeves in jackets and coats. 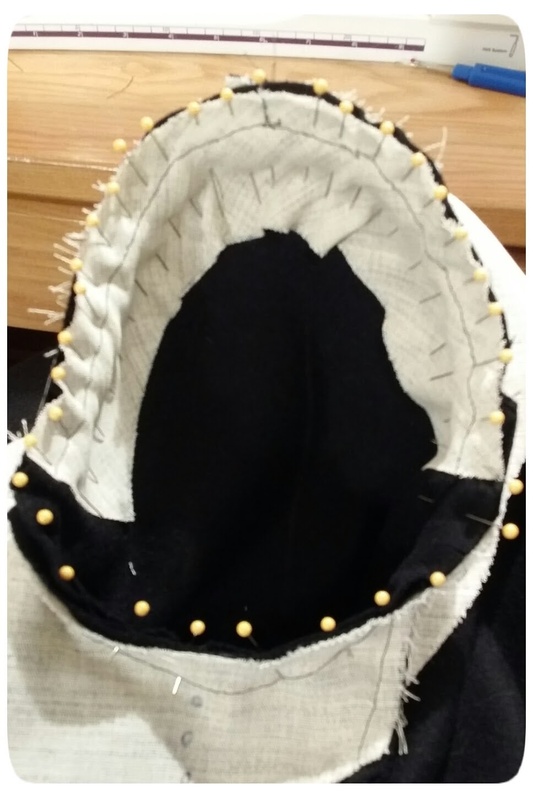 I ease the sleeve cap with bias strips of hair canvas. 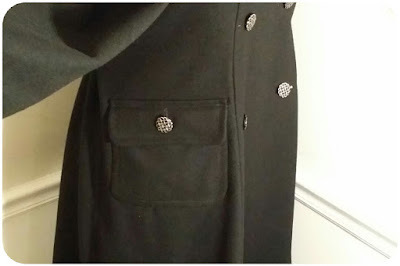 See the details here on Tailoring a Coat Sleeve. If a pattern suggest shoulder pads, use them! If you're making a coat and it doesn't suggest shoulder pads, use them anyway! Even a thin set, about 1/4" thick can make a difference. I make my own. I've talked about that here and here. In my sewing group, The Amazing Sew-Alongs, we discussed using fleece shoulder heads. Since I set my sleeves with the bias cut hair canvas strips, the sometimes act as shoulder heads. I make a judgement call on how the sleeve is hanging regarding whether or not I need to add an additional sleeve head. For this coat, I didn't. 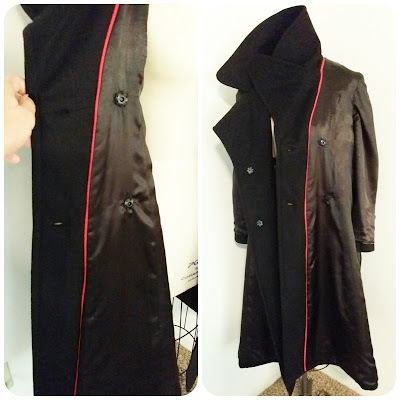 Before I added my lining and I was trying on the coat, there was a glaring detail missing: pockets! 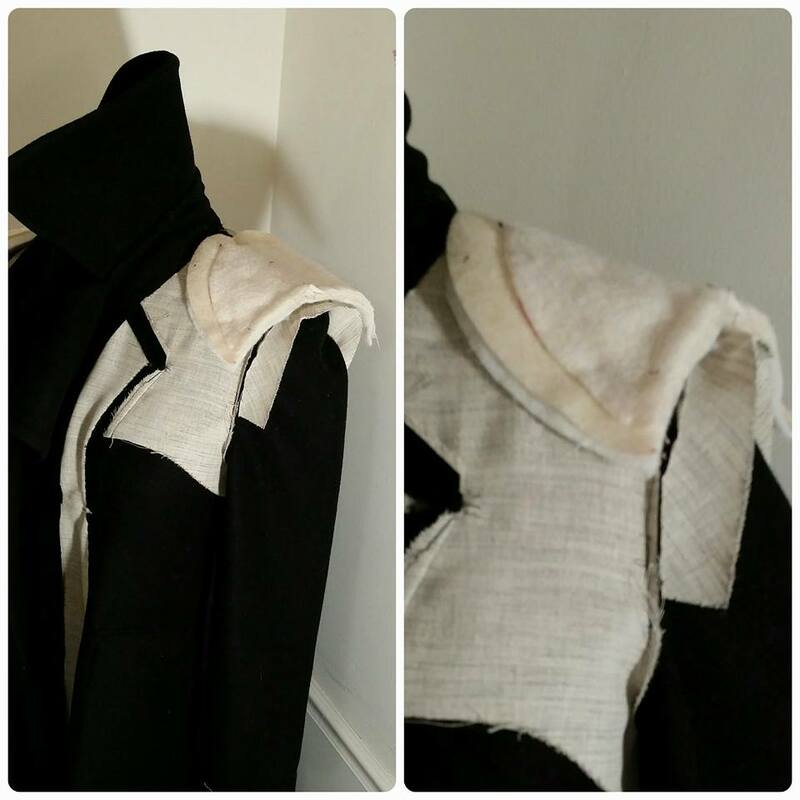 I don't remember which one I used, but I grabbed a patch pocket and flap from another coat pattern, measured down from the shoulder and placed. I topstitched it in the same manner as the other topstitching. This Michael Kors coat was my inspiration. Here is the inside! Y'all know I love beautiful insides. I'm never ashamed to allow someone to examine my garments inside and out. The lining is completely handsewn instead of being bagged. Instead of doing a basic cross stitch to secure the back lining pleat, I just use a cute embroidery stitch. And I added a hang chain that I also bought at Jo-Anns. I added a contrasting color piping between my lining and facings. The hem of the coat is interfaced -- of course. A "Jump Hem", which is a pleat formed at the lower edge for wearing ease is created. Also created at the sleeve hem as well. The coat was sewn with Schmetz needles in Universal size 80/12, 100/16 with Gutermann Mara 100 in black. And topstitched with Schmetz 100/16 topstitch needles, using Coats & Clark Button Craft Thread c/o Coats & Clark. And love that when I take this coat off in public and turn it inside out and toss it over a chair, the inside is just as beautiful! My lining fabric is Black Flannel Back Satin from Jo-Anns. And it also looks and hangs beautifully when undone. I saw that Burda! It's beautiful! Thanks Deborah! That's I high compliment! I love that brand! Thanks! Hey Erica - I look at all your wears. I will give a moment of silence for this one. I second the moment of silence!!!! Gorgeous coat! You should be so proud as you wear it. You dont sew a coat...one has to "build" a coat. You did a beautiful job! Thanks always for your inspiration! I love that -- "Build a Coat"! Thanks Eleanor! I think it's pretty much these vintage ones. The pattern companies need to do better! Thanks Hannah! Your coat game is outrageous! Super inspiring. I hope to follow in your footsteps one day soon. This coat is so cool, so sharp and so classy. Every time I read your coat creating posts, I am just in awe! Thanks Angela! I enjoy making them so much! Thanks Cidell. They're old and from a local store... some brand I had never heard of. Ha sorry they were supposed to be clapping hand emojis. 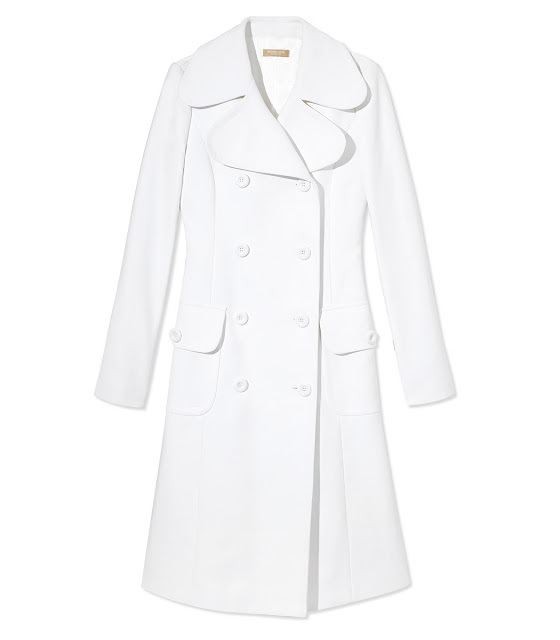 A gorgeous coat for a gorgeous lady. Worthy of an Ohio winter - lol. Thanks Robin! Waiting on those cold days now! This is so amazing and thanks for sharing so many details. I wish your Joann's was my Joann's, you find good fabric and notions at yours. Mine is just fleece! I am going to have to remember the decorative stitching at the back pleat, another nice detial. We have a newer Joanns Superstore. It's pretty nice. Thanks Lori! Fabulous and it's impressive how it ressembles Michael Kors's. Nothing's new under the sun. Nothing at all! Thanks Marie! Absolutely beautiful coat. Great job! I am in awe! What a fabulous coat. What a fabulous coat! It's beautiful inside and out! You've just inspired me to make my own! I am in awe. You did an amazing job on that coat. Wow! This coat is stunning. What an amazing job you did with this coat! Wow!!!! Lora, it's just a serpentine stitch... it looks similar to a zig zag but with rounded corners. It's just a matter of stitching up and down and across. So absolutely gorgeous, you wear your coat well! So fabulous! You did an amazing job and I appreciate all your tips! Everyone of your coat project have been fabulous and this one is no exception. You're creation has my imagination bubbling......thank you. And excellent work! Love the bias hair canvas strip as sleeve head. Enjoy your coat! Stunning! Fabiani would be proud. I recently discovered Fabiani patterns, I am a fan of his clothes now. The tailoring in his designs is beautiful. This coat is gorgeous, they dont make them Like that any more well if you are willing to pay about $5000 probably you could find something like your coat. You must be thrilled! You are so correct. You will not find a coat like this in a store. Thanks Word Signs! Stunning coat, inside and out. 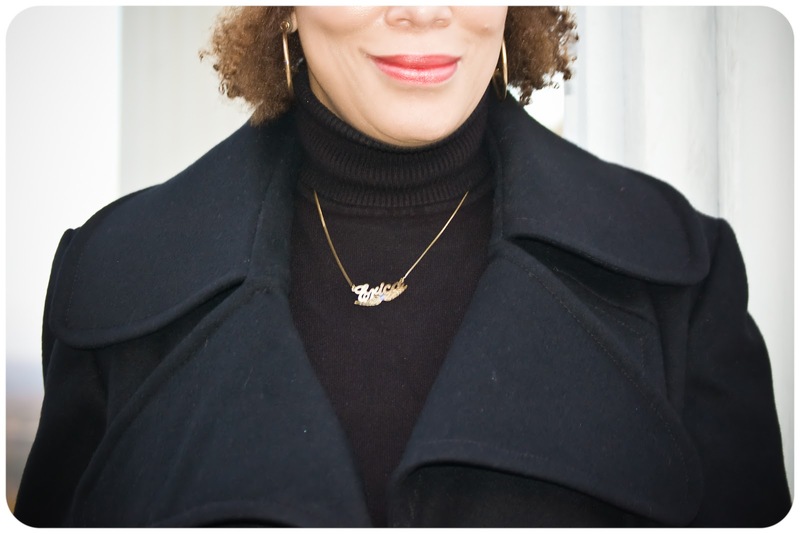 I'm often put off double breasted coats and jackets because I tend to wear them open and they can look odd, but yours doesn't at all, as you say it hangs beautifully and evenly. Now I have to figure out why so I know what to look for in a pattern! SO incredibly beautiful and classic and stylish and everything! I always look forward to your coats! This is another beauty! I love the contrast piping on the inside and the fit is so 70's chic! Gorgeous work, as always! Woa! I'm blown away by your skills! So gorgeous..... and chic! 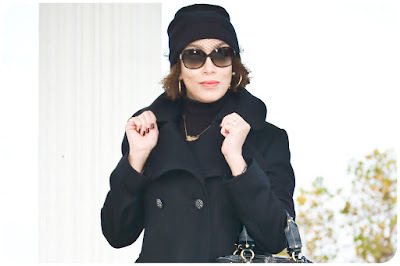 Fantastic coat, a black coat is such a great wardrobe piece. It is! I can't believe how long it has taken me to add a long black coat to my wardrobe! Thanks Beth! Erica, beautiful coat! Your tailoring and sewing skills are top notch!! You are my inspiration. In a previous post somebody said that they wished you would teach sewing classes. Have you ever thought about that, Craftsy online maybe? No, I haven't considered that. But thank you so much for thinking I'd be good at it! Thanks BPatricia74! What a beautiful, beautiful coat! While it is always a pleasure to see anything you sew, your coats have an extra-special beauty to them. Do you know, I still think about your camel's hair coat! I hope you enjoy every moment of wearing this new stunner. That coat will always be a favorite! Thanks ElizabethDee! That is such a gorgeous coat. I really need to fire up my sewing machine again. I'm sitting here with my mouth hanging open! You just amaze me! This is so over the top gorgeous! Wow, this coat is amazing. You took great care in the instruction. It's going to last you for years! I didn't know you had a sewing group. I will be joining! Wow! Eric, you did a fabulous job on that coat! Looks so professional and you wear it very well. Thanks for sharing all the photos! You're very talented. I'm new to your site and I have to say I'm inspired with your quality of work! I have a lot more reading to do, keep up the great work!